A struggling author returns to the town he grew up in to revisit some skeletons of his past for a new book. He finds romance, friendship and more evil then he can deal with as townspeople start disappearing. Stephen King can really describe a setting and get you settled in. He gets the reader the feeling of being comfortable and then boom here comes the creepy. The creepy just increases and increases. For me I keep thinking wait let's go back to the comfiness. I want to see author, Ben, connect more with townie, Susan. When I read King I expect major scariness, the creeps and...not completely welcomed nightmares. This one had some creep factor but it was not really scary to me. I find his short stories scare me the most. It was a decent book. I was not thrilled with the ending either. In some ways it set up for a sequel although I do not know if there is one or not. I know there is a short story prequel called Jerusalem’s Lot which I have never read. For a vampire book it had some interesting takes on the usual mythos. 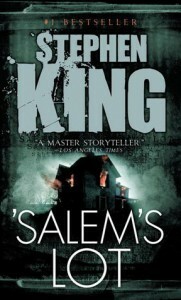 Other than that I say there is better Stephen King books if you want scary but it is some very good writing.